In Orlando, more than 2,300 pounds of turkey and nonperishable items and $3,000 in monetary donations were collected during the two-week drive, which ran from November 1 to 15. “I am so proud to be part of a Team that is truly dedicated to living out our company’s Purpose of Building Dreams, Enhancing Lives,” said Valerie Wagoner, marketing coordinator for David Weekley Homes in Orlando. Locally, the Thanksgiving Drive benefitted Second Harvest Food Bank of Central Florida, a nonprofit organization that annually collects and distributes more than 50 million meals to 550 feeding partners in the Central Florida area. David Weekley team members delivered the collected items to Second Harvest Food Bank of Central Florida to distribute to families in time for the holiday. 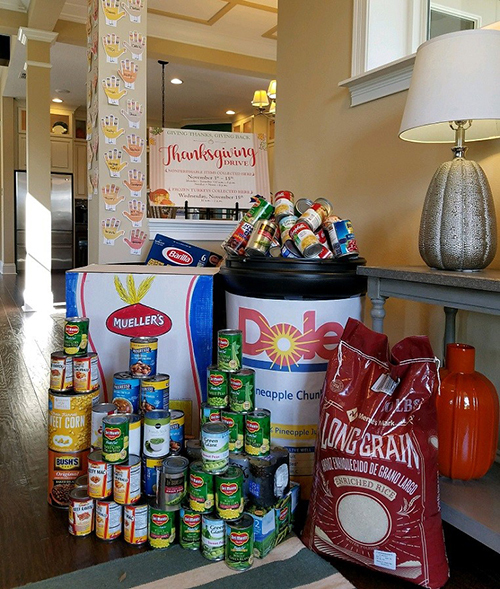 Team members from David Weekley Homes donated more than 2,300 pounds of food, enough for nearly 14,000 meals, to Second Harvest Food Bank of Central Florida to benefit families in need.